The benefits of reading to children are well known – from their earliest years, it helps improve their language skills, enriches their vocabulary, teaches critical thinking and logic skills, and encourages creativity and a thirst for knowledge. Reading is, therefore, a great parenting activity to bring you closer to your child as they reap its benefits. Also important, to adults as well as to children, is the way reading and literature can impact our ideas, goals, and moral code. Recently there’s been lively discussion about the importance of representation in media – with good reason. As sociologist Stewart Hall wrote back in 1973: “the mass media are more and more responsible for providing the basis on which a group constructs an ‘image’ of their lives, meanings, practises and values”. Though he refers here to constructing images of others, it’s safe to say we also construct an image of ourselves through media consumption – and through literature. The image created can be either positive or negative, so with a vulnerable group such as young children, we need to participate and expose them to the best possible role models to help them construct an image of their own identity through positive character representation. Accordingly, with principles of equality and feminism now in the forefront of public discourse, we need to think how we can raise young girls to grow up confident and with healthy images of themselves. And literature can offer them many examples of characters they might want to emulate – not simply the ‘strong female character’ trope, but diverse girl characters – emotional girls, stubborn girls, shy girls, talented girls, smart girls, imaginative girls. 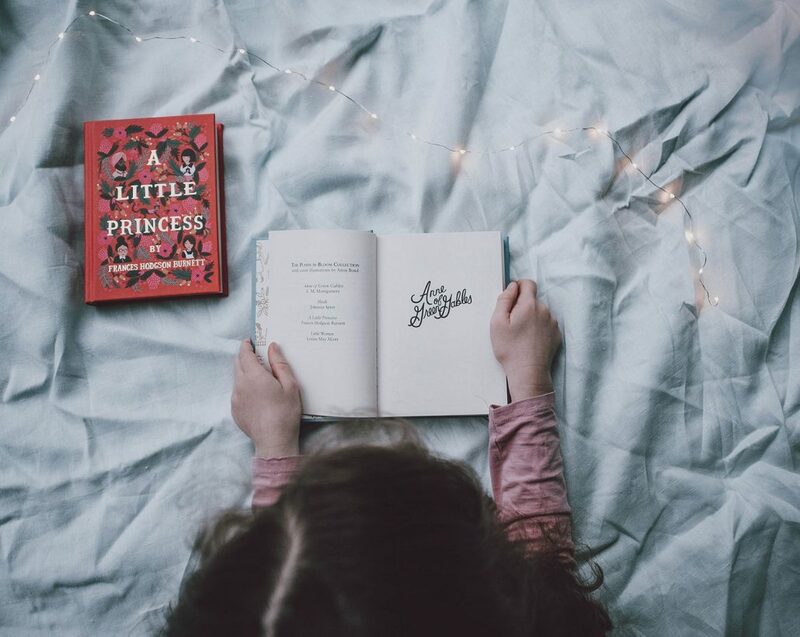 Books do not have to have female lead characters in order for them to have a positive impact on girls – you can choose from many which feature girls among the protagonists. It’s worth noting that these books are not only good reading material for girls, but for boys as well – they can learn a great deal from these remarkable heroines and enjoy their adventures along with their female friends. Moreover, these stories impart a healthy and varied image of girls, which can teach boys important lessons in valuing and respecting strong and different women in their lives as they grow up. Here are some of the books that feature those exact types of characters. Consider reading these with your daughter and afterwards engaging in discussion, pointing out positive aspects of the characters, especially their diversity, character growth, and the fact that not only strong-willed girls are mighty girls. This classic series by Louisa May Alcott seems like a good start to bring your child into the world of literature. For a century and a half, girls have grown up with the four March sisters, and there is a good reason for that. This is not only a coming-of-age story for girls, but a story about four very different girls and their tight-knit sisterhood. The most obvious role model is Josephine ‘Jo’, a strong-willed, wild girl and aspiring writer, who is stubborn and kind at the same time, always putting family and friends first. Yet the other three sisters should be considered equally valuable models. The eldest, Meg, illustrates the value of maturity and personal growth, as we see her personality transform from a vain lover of luxuries to a down-to-earth, dedicated family girl. Beth, second to youngest, shows how shy, fearful girls can also have a lasting impact on others and change lives; Beth is hardworking, helpful and humble, a great example of the power of quiet, introverted, peaceful people. Finally, the youngest sister, Amy, considered the most self-centred, selfish and spoiled, also proves to be a great example of growth, as further along in the story she becomes compassionate and principled. It’s also worth pointing out that this character was based on Louisa May Alcott’s own little sister, who was one of the few women who made it into the art world of Impressionism at the time. When it comes to tomboy characters, Georgina – George – of the Fantastic Five has always been the pivotal example. With short hair, fierce temper, wild nature, and dressed as a boy, George stands out from the girly-girl type of character usually present in children’s stories. Even in this particular series, we have her friend Anne, part of the five, who is the spot-on picture of the motherly, caring, domestic girl. George, therefore, can be a great example of the fact that not all girls have to have these qualities to be loved. But the greatest importance of her character might be to parents of non-gender-normative girls, those who do not fit into stereotypes, or are particularly masculine from an early age. If you want to support your child’s journey in search of gender identity and show them that they should act as they feel comfortable, without filling a certain mold, this just might be the best book to read and discuss with them. Another beloved classic is famous for its young protagonist, Sara Crewe, who has influenced generations of girls over the years. In this well-known story about a girl who seemingly lost everything in a day, we can see the strength of resilience, kindness, and imagination. Sara’s best quality is her willingness to help others, her ability to benefit from other’s happiness and her wild, wonderful imagination that helps her confront events much bigger than herself. If you decide to read this book to your child, be sure to point out Sara’s empathy and strength to deal with other people’s problems, while she also fights her own. Two movies have been made from the book – the famous 30’s version with Shirley Temple, and Alfonso Cuarón’s colorful imaginative version, so we recommend watching them with children after reading the book. Kira-Kira deals with the very serious and fraught subject of cancer and illness of a sibling, but if you think your child might be able to deal with this topic and difficult emotions, it’s a great piece of literature from which kids can greatly benefit. This coming-of-age novel has Katie, a Japanese-American girl, as its protagonist, and it follows the narrative of the illness and death of Lynn, her sister and best friend. Katie is not a typical strong heroine in terms of fighting evil forces, but constantly throughout the book she fights with tragic problems of everyday life, from racism and bullying, to illness and death. Children reading the book should pay extra attention to the changes in character of both Lynn and Katie – their boldness while they deal with something much bigger than themselves, and their amazing connection and influence on each other. While the book does not deal with happy, light topics, what is key in the story is how Katie manages to see the beauty in things and finds strength even in the darkest times – which is a good lesson to teach a child. Finally, as the characters are of Japanese descent, the story of Katie and Lynn can offer some diversity, as the lack of children’s books with characters of different races and ethnicities is very evident and problematic. This very atypical series of books for children might not be for everyone – the series follows, as the name suggests, the unfortunate lives of the Baudelaire orphans, three very special children who find themselves in the middle of terrible tragedies. Even with a storyline like this, Lemony Snicket manages to make books as light-hearted as possible, with quirky humor and strong emphasis on the children themselves and their strengths. The oldest of the orphans is Violet, a brave and smart girl who has a knack for inventions and logic. While she is charming, polite, and kind, she’s not your typical strong-willed heroine, but someone who manages to pull herself and her siblings, Klaus and Sunny, out of various situations using her imaginative brain and her masterful inventions. Violet is a perfect example of the force of intelligence, and she might motivate your young girls to develop a love for inventions, explorations, science, engineering and mechanics. This trilogy falls under the category of young adult fiction, so it is not exactly reading material for very young girls, but it’s a great book for your teens. Set in Victorian England, this fantasy fiction, set in an all-girls school and magical realms, features best friends, each one a great example of a well-written, well-rounded character with both good and bad sides. The heroine and narrator, Gemma, is an obvious role model, being strong, brave, and full of hope and kindness. However, her friends are even more interesting in that regard. Felicity, who starts off as Gemma’s enemy, grows into her faithful friend and proves to be a woman-warrior, going against all the norms of her society. Stubborn and strong-willed, she’s not always right or kind, yet she can be a thrilling character for your fierce, rebellious girl. Poor, shy, and hard-working Ann starts as a closed-off character with an unfortunate fate ahead of her, only to grow out of her shell throughout the book and follow her dream. On top of it all, the trilogy also features a great spectrum of strong and amazing female teacher and tutor characters, and a great representation of multi-ethnic romance. Readers should reflect on how these girls work on their personal growth, try to be the best versions of themselves, turning more and more towards their growing friendship. These are only some of the titles that can prove to be useful when trying to find quality reading material for your children. Reading and discussing literature is always valuable for children, so these book will hopefully make it even more fun and influential. Hall S. 1973. Encoding and decoding in the television discourse. Univ. Birmingham, Centre for Contemporary Cultural Studies. Stenciled Occ. Pap., No 7. Media Ser. If you have any question in regards to the books and reading, you’ve come to the right place!